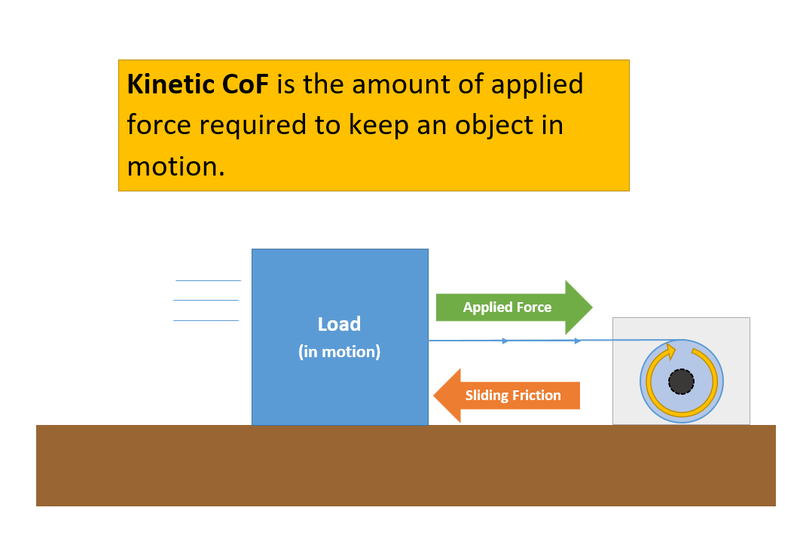 Coefficient of Friction, commonly referred to as CoF, is a ratio of the force required to move one surface over another to the total force applied normal to those surfaces. In more common words – CoF measures how slick or slippery a surface is. In this post we will talk about CoF within the context of aluminum foil based packaging. CoF is broken down into two readings, Static and Kinetic. 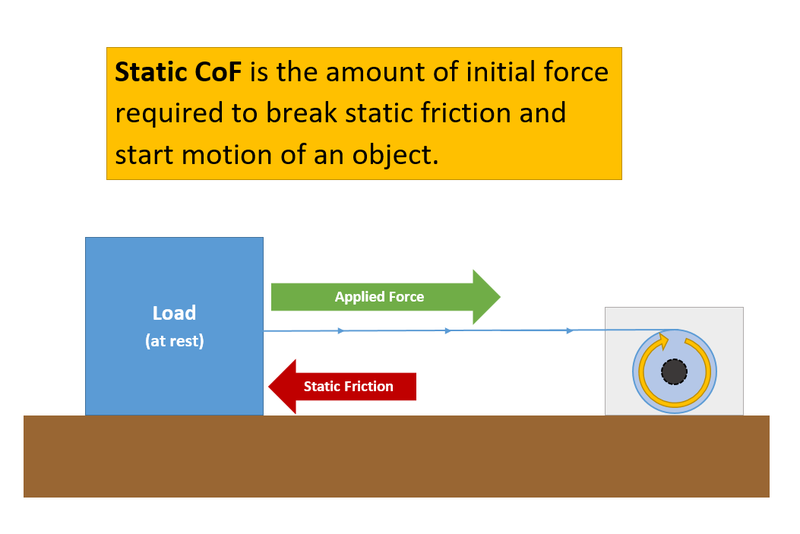 Static CoF is the ratio of force required to move one surface over another from the instant motion starts while Kinetic CoF is that same ratio once the surface is already in motion. 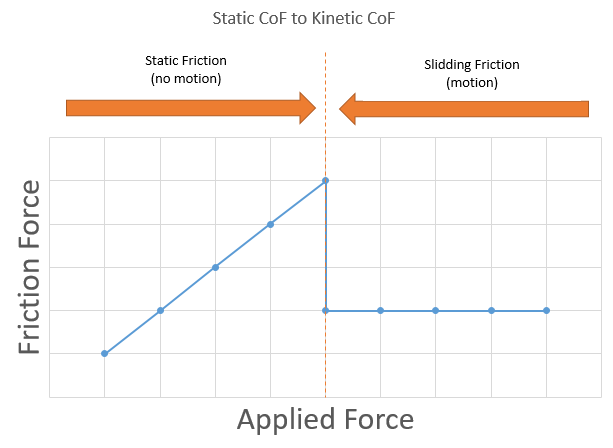 To once again break it down in more common terms, Static CoF is the force required to get moving while Kinetic is the force required to keep moving. As applied force increases – a tipping point is reached which puts an object into motion. Once in motion, the objects requires less applied force to remain in motion. CoF can be vital to the performance of a wrap on a packaging line, particularly on high speed packaging lines. Any time a wrap or wrapped item is pushed, pulled, dragged, or grabbed throughout the wrapping process its CoF comes into play. At Catty we have solved a variety of wrapping problems through modification of CoF. When our wrap wasn’t wrapping tight enough around a customer’s chocolate pieces, we lowered the slip on the wrap to allow the end folds to slide more easily over one another leaving a tighter overall seal. When we observed errors in another customer’s lines while their chocolate piece was transferring from one grabbing mechanism to another, we lowered the CoF to allow a cleaner release from the grab. Although less common, issues can also arise if CoF is too low on a wrap (product is too slippery). In certain packaging lines, wrapped items are moved from one stage to another using wheels or belts and a wrap with too low of a CoF might be difficult to grab or move. Increasing the CoF would allow such wheels or belts to better grip the product. Another symptom of too much slip in a wrap is slight build up on packaging lines of wax or silicon over time- if you are noticing such build up, you may need to lower your CoF spec. 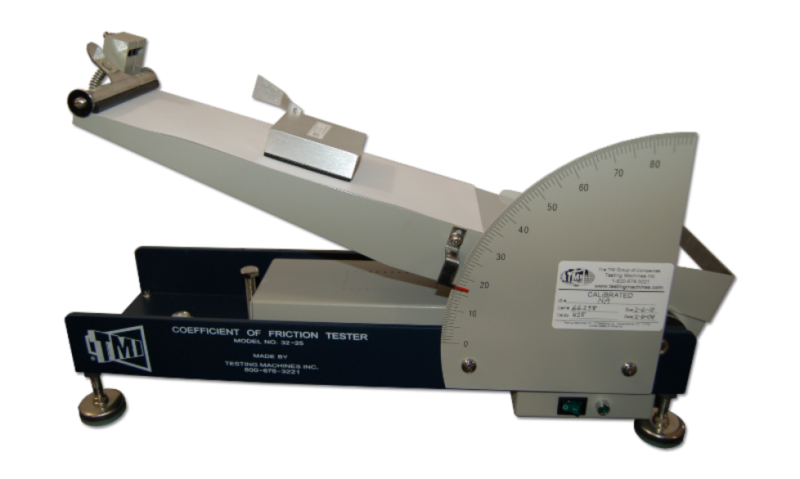 Although electronic machines such as the TMI unit in Figure A have become the standard for CoF measurement, CoF is also commonly measured using an angle-based CoF like the one featured in Figure B below. 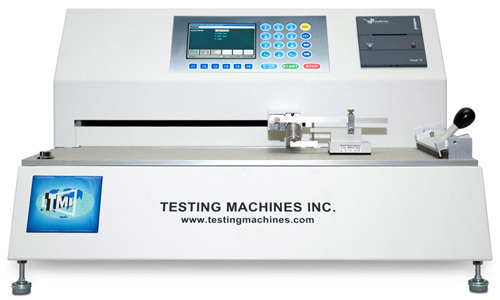 When testing a material’s CoF on an angel-based tester, the substrates are laid down face to face, just as in the electronic testing, but instead of pulling the weighted sled with a load cell, one side of the platform is slowly raised until the tipping point is reached where the sled starts to slide. The angle of that breaking point is then used to calculate CoF. When it comes to selecting the right range for CoF on your foil packaging, we have found that at the end of the day the best determinant of selecting an appropriate CoF is wrap speed. The faster your machine, the lower the CoF spec should be. We have put together the chart below as general guidelines for choosing both a Kinetic and Static CoF Spec.